Several years ago, a dear friend of mine asked me to help her create special gifts for her stepmother and mother-in-law. 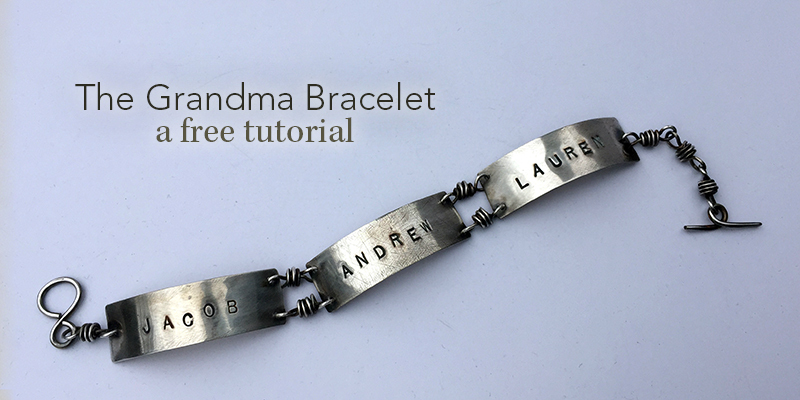 Together we created what I like to call The Grandma Bracelet, a metal stamping project that’s totally one-of-a-kind. It’s a simple way to craft a special keepsake for grandmothers who love their grandkids to pieces. 1. 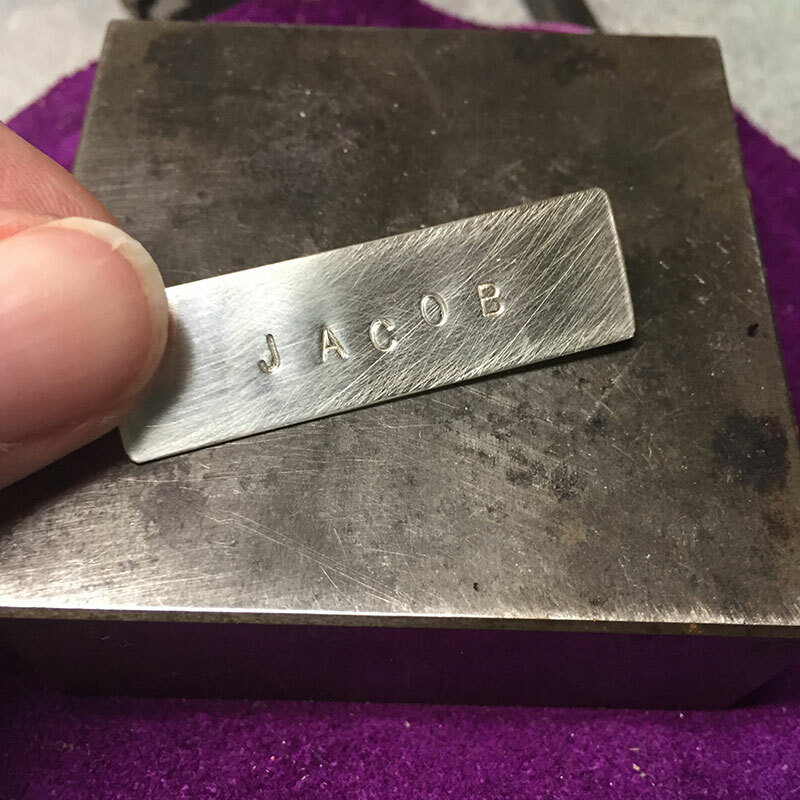 Start by filing the sharp edges of the sterling strips where you’ll be stamping names. In this example, I have a strip for each of my three children. 2. Organize the letters you’ll need to stamp names on the tags. I like to have all the letters I need right in front of me. Working from the center out, with the metal strip on your bench block, metal stamping the names on the tiles. For the example shown, I stamped the “C” in Jacob first. Then worked my way out, stamping the “A”, then “O”, then “J”, then “B”. Have fun and shift the letters. it’ll drive you crazy trying to make them line up perfectly. 3. Repeat the metal stamping in Step 2 for the remaining names and metal strips. 4. 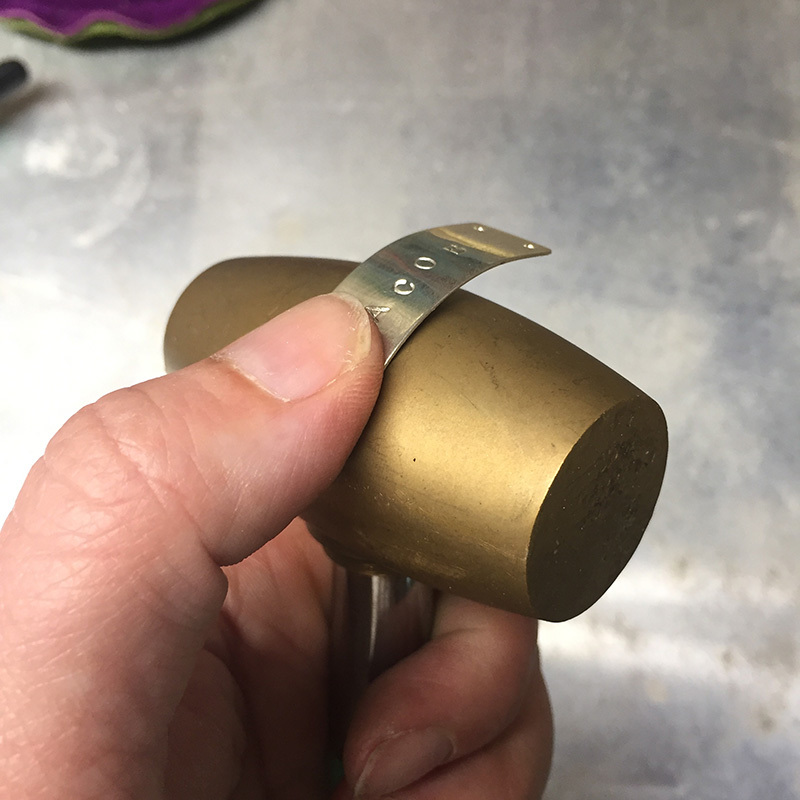 After metal stamping: Using hole punch pliers, add 4 holes (one in each corner) to the center tag. On the two outside tags, punch a hole in each corner on the side that will line up with the center tag, and punch one hole in the center of the outside edge. Then, add a slight arch to the links by wrapping the strips against the handle of your hammer. This helps make the links hug your wrist more comfortably. 5. 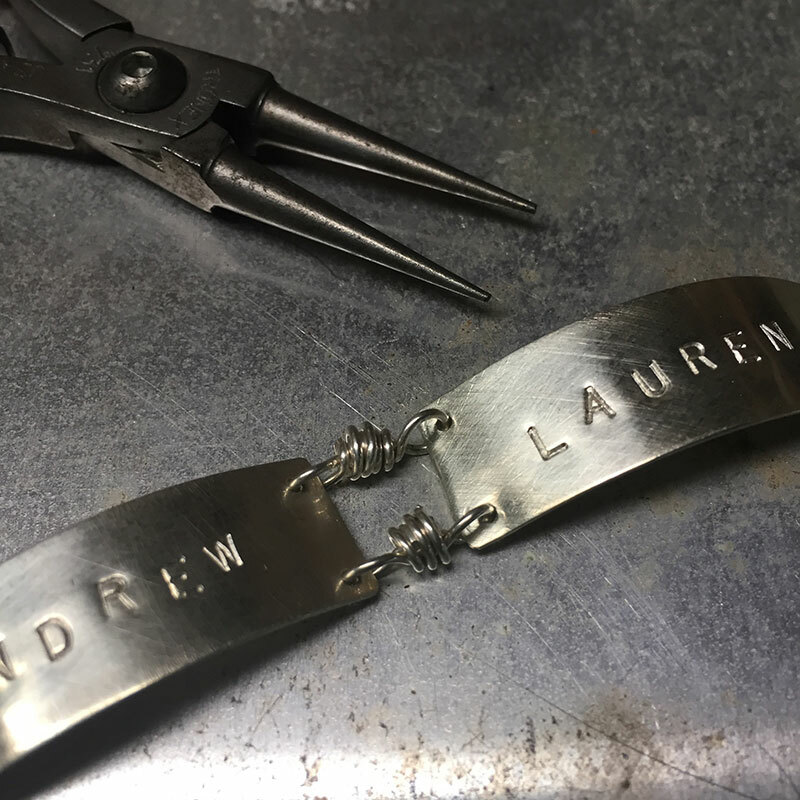 Using round nose pliers and 4 inch pieces of 20g sterling silver wire, make wire wrapped loops to link the tags together. It gets a little tricky linking the third and forth holes together, but go slow, you’ll get it. I really like the chunky look of overlapping the wraps too. 6. Attached the clasp by connecting the loop of the toggle clasp on one side with a wrapped loop. On the other side, use a length of chain and the bar side of toggle. Adjust the length of chain to adjust the finished length of the bracelet. 7. 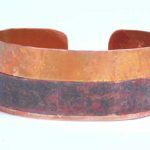 To finish things up, oxidize the bracelet with liver of sulfur and tumble for an hour, then polish to highlight the stamping. There are many ways to make this bracelet unique. 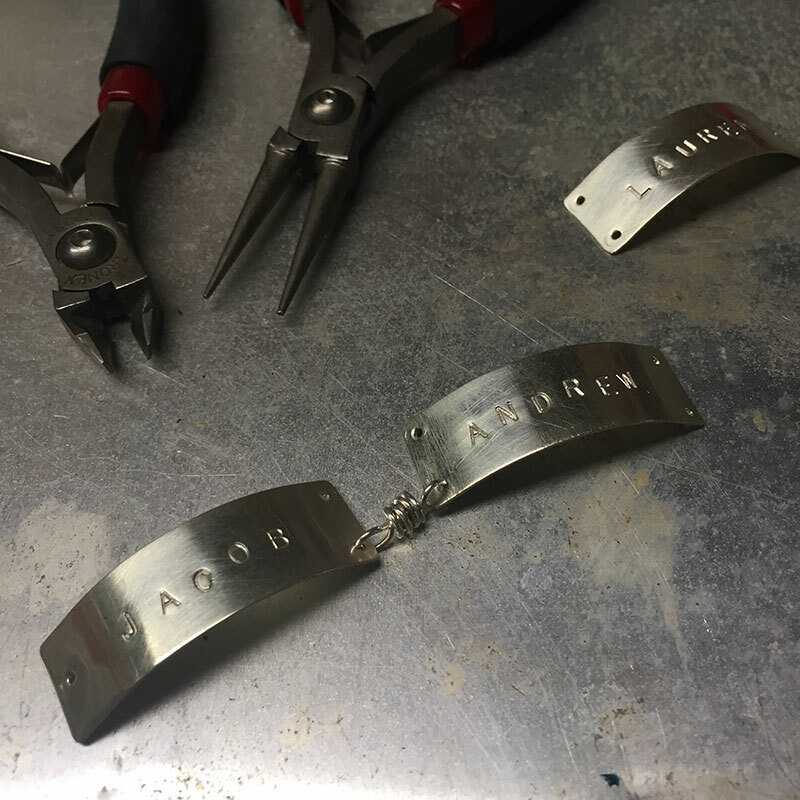 As your family grows, add a stamped metal charm with the baby’s name as a dangle to the bracelet. 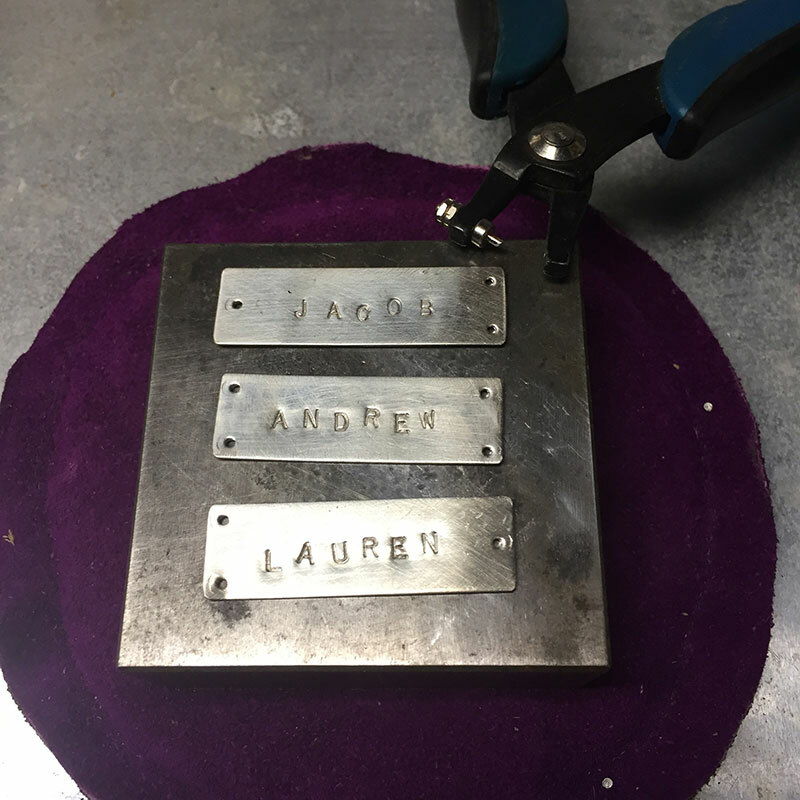 If you have siblings, try metal stamping a strip for each of your siblings and put all their children’s names on their strip. 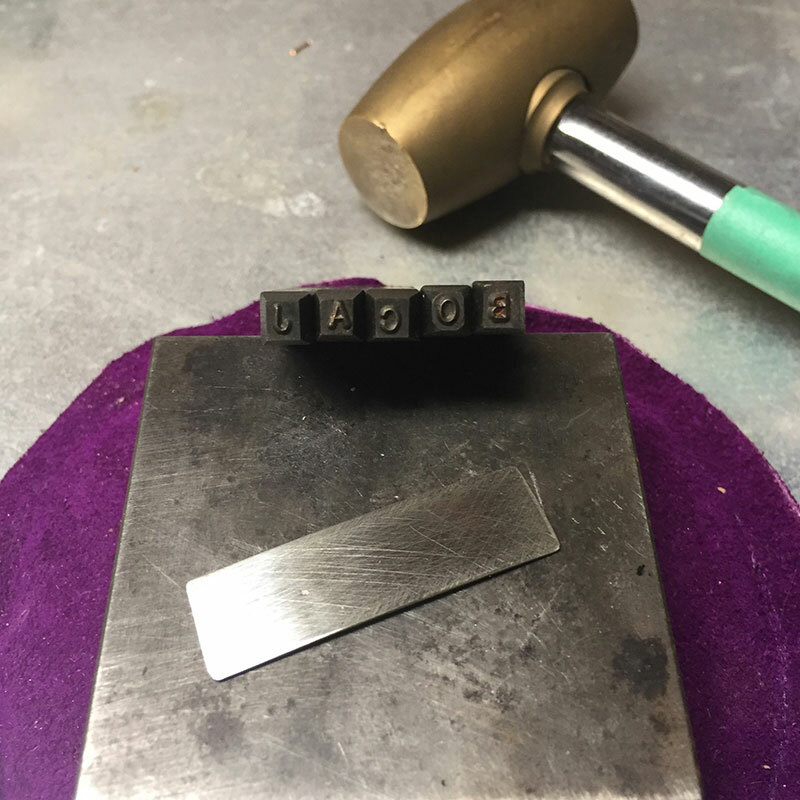 For even more ways to embellish jewelry with stamps check out New Stamped Metal Jewelry by Lisa Niven Kelly and Taryn McCabe. 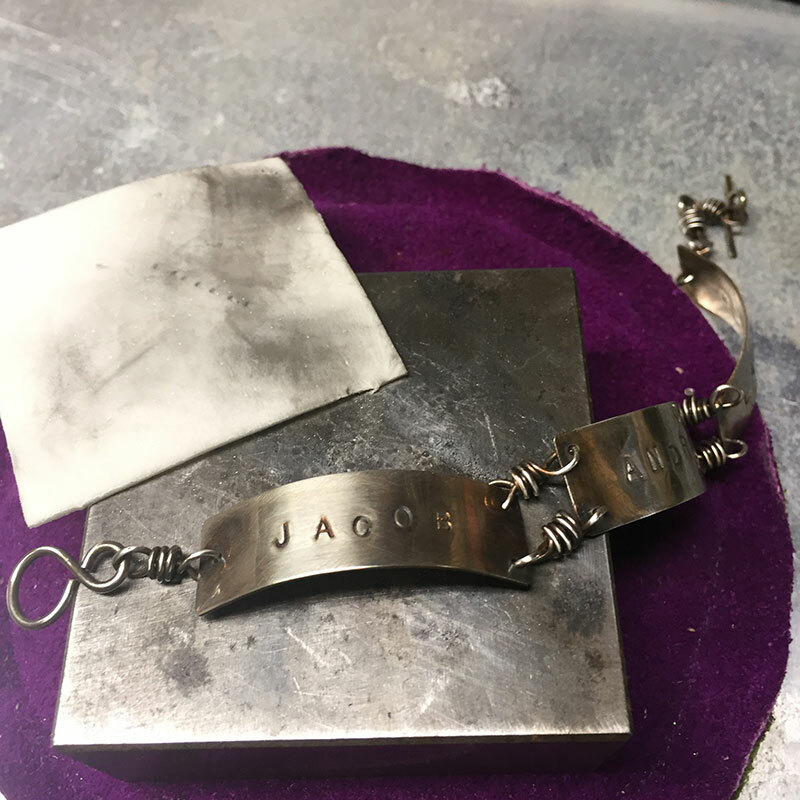 It’s packed with a variety of metal stamping techniques and over 20 unique metal stamping jewelry projects you can make in no time! You can grab a copy of the eBook today or order a print copy.